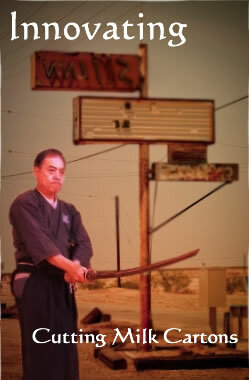 because we use real swords in IAIDO. We actually cut things in training in order to ingrain the techniques into our bodies. cutting on the draw. I drew the sword and then cut, but cutting bamboo wasn’t very much fun. I then practiced cutting by tying old tying old TATAMI that I had cut into seven to eight centimeter wide stick around the bamboo. This is fairly difficult because TATAMI is rather hard. Just one TATAMI tied (around the bamboo) is pretty easy. I then tried cutting on the draw.” I thought a lot about how to improve my cutting. (realized that) my arms could be cut. The sword has to be drawn straight. I practiced drawing straight and fast. 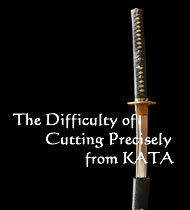 Cutting perfectly with the precise movements of the KATA is very hard. You will be able to cut if you just cut with the KATA’S form, but in KATA training we assume that our opponent is really there, so where our KISSAKI is pointed becomes an issue. It’s difficult for the KISSAKI to stop neatly in the position that the KATA demands. Keiko is about how close you can get to this pint. The MAKIWARA require a lot of time and effort. They’re soaked in water to achieve the same effect as cutting as cutting a human body, but preparation is troublesome. The cut pieces are industrial waste, and throwing them away is an ordeal. Instead of cutting MAKIWARA, I thought of cutting milk cartons. of the four corners, but that last corner will remain uncut. Everyone is hard pressed to cut this last corner. They smack the cartons, and the cartons fly away. If you can eventually cut a milk carton, then you can cut a heavy MAKIWARA balanced on the stand without it being spiked. Because cutting a milk carton on the draw from SEIZA with YOKOICHIMONJI is natural for me, One day I could do it. I cut cleanly, and all that was left were two burrs less that half a millimeter in size on the fourth corner of the carton. The main point is TENO UCHI. When you put the MUNE (back) of the handle in the fork of your thumb and index finger, the hand becomes a soft shock absorber. Your thumb is hard and the handle will be up against its second knuckle. When you do this, the angle of the cutting edge is like that of a single-edged knife. Only the high side of the sword the cut milk carton gets pushed up and flies away. This principle is the same for KESA and GYAKUGESA as well, not just YOKOICHIMONJI. Everyone struggles with this without really understanding it. At first both the top and the bottom fly away, and the area that’s cut looks like it’s been torn off. dangerous because it’s no more than plan violence. Copyright © 2019 福岡・居合・剣術 | 財団法人 無外流・筑剣会 All rights Reserved.